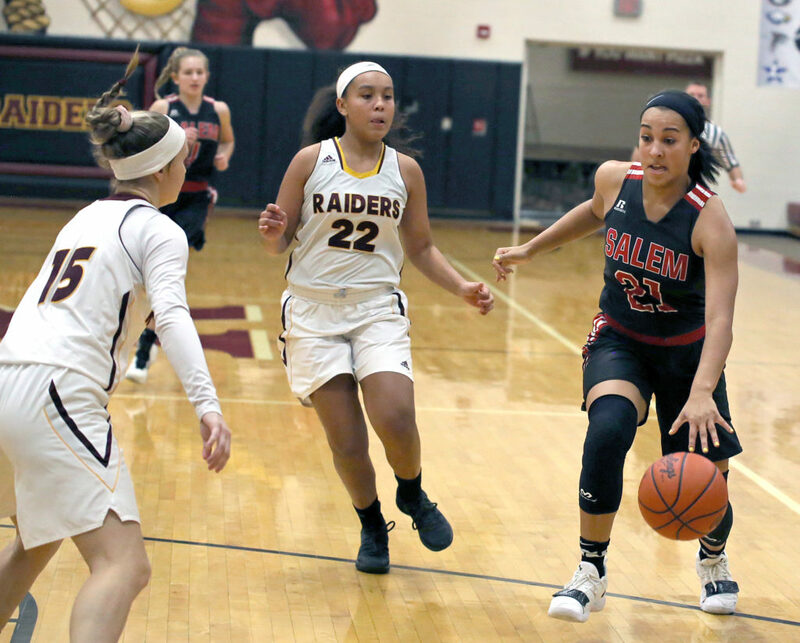 GREENFORD — Salem’s girls basketball team closed out South Range 48-44 on Friday during the final game of the day at the South Range Holiday Classic. Salem (8-3) will meet Youngstown Ursuline in the final game of the day at 7 p.m. on Saturday to close out the event. Izzy Lamparty had 16 points and nine rebounds for the Raiders. Bree Kohler added nine points. South Range will meet Hathaway Brown at 5:30 p.m. today. GREENFORD — Grace Heath made three foul shots with 0.3 seconds remaining as West Branch held off Howland 29-27 on Friday during the South Range Holiday Classic. 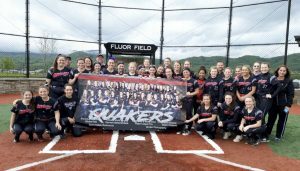 West Branch moved to 8-1 and will face 9-0 Akron Hoban at 2:30 p.m. today at South Range High School. Heath led the Warrior scoring with 17 points. The Tigers won the jayvee game, 40-26. The Warrior jayvees will play Tusky Valley at 10 a.m.
HOWLAND SCORING: Clark 6-0-12, Ochman 4-0-9, Dellimuti 1-0-2, Chambers 1-0-2, Pomplia 1-0-2. TEAM TOTALS: 13, 0-3: 27. W. BRANCH SCORING: Grace Heath 1-1-3, Grace Heath 6-4-17, Sammie Tuel 0-1-1, Maddie Showalter 1-0-3, Anna Lippiatt 1-0-3, Peyton Alazaus 1-0-2. TEAM TOTALS: 10, 6-9: 29. Three-point goals: Howland 1 (Ochman), West Branch 3 (Heath, Showalter, Lippiatt). NORTH JACKSON — Mogadore sank 14 threes in defeating Columbiana 80-65 on Friday at the Jackson-Milton Holiday Tournament. Columbiana falls to 4-5 and is at Leetonia on Jan. 4. Ryan Fahs led the Clippers with 14 points and five rebounds. Matt Mazei had 10 points and 15 rebounds. Hunter Zentner and Erik Hopfenziz had 12 points each. Kyle Coffman had 24 points for Mogadore, while Lucas Schwartz had 22 points. Columbiana won the jayvee game, 57-43. Dalton Whitehair had 24 points for the Clippers. COLUMBIANA SCORING: Hunter Zentner 6-0-12, Seth Ross 0-0-0, Ryan Fahs 6-0-14, Zach Clark 1-0-2, Erik Hopfenziz 4-0-12, Chase Franken 1-2-4, Sean Whitehead 4-0-9, Dalton Whitehair 0-2-2, Matt Mazei 5-0-10. TEAM TOTALS: 27, 4-7: 65. MOGADORE SCORING: Eli Robertson 1-0-3, Kyle Coffman 9-1-24, Lucas Schwartz 6-4-22, Cameron Ramirez 3-0-7, Connor Kerr 4-0-8, Aaron Morris 3-2-9, Nathan Stephenson 3-1-7. TEAM TOTALS: 29, 8-12: 80. Three-point goals: Columbiana 7 (Hopfenziz 4, Fahs 2, Whitehead), Mogadore 14 (Schwartz 6, Coffman 5, Robertson, Ramirez, Morris). CARROLLTON — West Branch’s boys basketball team was dealt a tough 65-60 road loss to Carrollton on Friday night in Eastern Buckeye Conference play. West Branch is 5-3 and 2-2 in the EBC. West Branch is at Canton South next Friday.